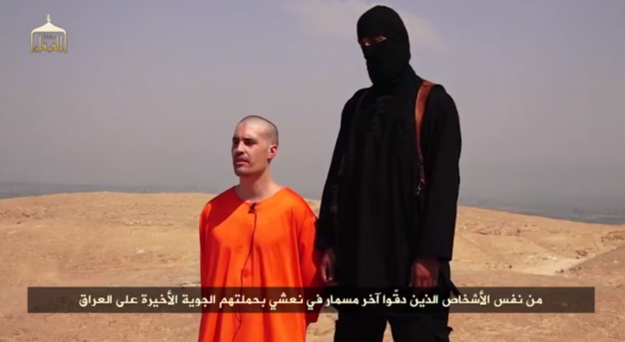 James Foley, US journalist, before execution, in a video released by IS on 19 August 2014. Image Source: Buzzfeed. I have a friend, R., who is a retired British army colonel. He once said to me: "March is not the problem! Beware the Ides of August, when everyone goes away on holiday. That's when the real trouble happens, when no one is at the helm." After that, I paid more attention to what happens in the second half of August. News stories ebb and flow as the MSM turn their attention from one item to the next. They create the false impression that one issue disappears while another suddenly intensifies. Ebola flares up alongside the crisis in the Ukraine. Those stories subside, combined with a ceasefire in Gaza, which draws attention to Ferguson, Missouri. This morning, Ferguson quietened, following news of the beheading of American journalist James Foley by the Islamic State (IS/ISIL/ISIS). The MSM initially covered the Foley story with numbing euphemisms such as 'risks journalists follow in conflict zones.' The Guardian was more concerned, citing 'outrage' and a need to identify James Foley's British executioner, who was obviously chosen to spread even more fear in the west. The euphemisms are a sign of fear. But this was the organization that even frightened Al Qaeda - until its Yemen affiliate decided formally to join forces with IS on 19 August (see report here). MSM journalists' rationale for downplaying IS is that not reporting on IS deprives the group of media sway; the MSM outlets refuse to be commandeered into becoming IS mouthpieces. However, the flip side of this decision is that the mass of people - unless they search online - do not know what is going on at all! MSM coverage misleads further, because all these news stories are ongoing and interrelate. Twitter surged to cover Ferguson's police brutality, witnessing the rise of America's police state. Michael Brown's shooting in Missouri also confirmed Obama's individual significance. His presidency marks a turning point in the history of race in America. The only problem is that troubles in Ferguson just happen to coincide with the total failure of Obama's foreign policy. The media seamlessly divert attention from foreign to domestic affairs without acknowledging what that diversion means. In a similar way, Clinton's 1998 impeachment during the Monica Lewinsky scandal obscured his foreign policy failures in Africa in the 1990s. One could argue that those failures helped pave the way to 9/11. NATO requires that its members have civilian and democratic control over their armed forces. This is a fundamental princip[le] that allows for military integration and inter-operability among members. Although NATO countries have different political systems — some are presidential republics, others are parliamentary — they all have transparent defense budgets and public and legislative oversight over their countries’ military affairs. This includes independent investigations into military failures and abuses, parliamentary control over how funds are allocating — or not allocated — for weapons programs and constitutional checks and balances on a leader’s ability to send troops to fight in foreign military operations. In Russia, however, civil control over the military is anathema to the basic principles of Prime Minister Vladimir Putin’s vertical power structure, which has effectively folded all three branches of power into one huge executive branch. Any autocratic power, by definition, rejects public accountability in all spheres of government — and this is particularly true for its armed forces. America's domestic accountability for her foreign policy is one reason why ISIS has overrun Syria and Iraq. IS took Mosul and are battling to recapture the Mosul dam - a critically important site left vulnerable in a desert country. That the Mosul dam and the Haditha dam are in jeopardy is a catastrophic failure in terms of American military and political strategy in Iraq. American airstrikes allowed Iraqi government forces to regain of control (barely) of the Mosul dam. The execution of James Foley was an IS media counterstroke for that IS defeat. Obama's passivity in this gathering storm confuses even his critics who expect him to do nothing. The trouble lies in the extended domestic sensibility America brings to its foreign politics. While Obama is emblematic of everything the Americans struggle with when they look inward, he has also epitomizes everything they struggle with when they look outward. How can this superpower, founded in revolutionary anti-imperialism, accept its mantle as an imperial global superpower? Many Americans reject any imperial legacy as uncivilized, autocratic and cruel. The president of the republic cannot become caesar. Progressive Americans demand at the very least that American foreign policy function as an arm of domestic values. Meanwhile, America's critics regard the US as a hypocritical power because it often acts well beyond that domestic democratic remit; and critics see the USA spouting democratic cant while secretly, tactically promoting vicious dictatorships. How can Obama respond to the Islamic State? As a domestically-minded superpower, America is trapped between the Devil and the Deep Blue Sea. Whether they are hawks or doves, Americans can't win. No mindset of small town democracy, with its civic and legal orthodoxies, will defeat the people who executed James Foley and who have tortured people across Syria and Iraq. The US cannot meet IS actions with hand-wringing, moral pleas and media blackouts. But if America moves ruthlessly to crush these brutal opponents, the USA becomes an agent of chaos, a torturer, a democracy that betrayed its best values. Others would argue that it is the USA itself that pulls the strings behind the curtains of conflict. It is one of the oldest problems in the book. Power corrupts. The American position changes depending on perspective. But whatever perspective on the USA you may take, one thing has happened that no one expected: America has found a way through.